Put the black rice, water and salt in a saucepan and bring to the boil. Cover and reduce the heat to low. Simmer for around 40 mins until rice is cooked. Drain and cool. Segment the oranges and reserve any juice. Pat the salmon fillets dry using kitchen towels. Season with salt and pepper. Cook for 5-6 mins – the skin should now be crispy and salmon easy to flip. Use the spatula to gently flip the fillets and cook until the flesh is nicely coloured, about 1-2 mins longer. Transfer to a paper-towel lined plate and rest for 3 mins. 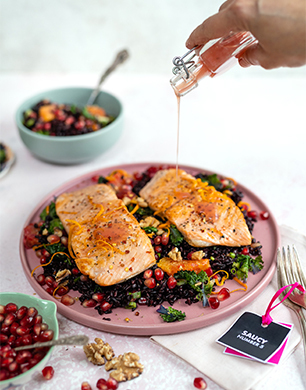 Top Tip: Drizzle The Saucy Fish Co.’s brand new product, Saucy No. 5 over your salmon. Made using four potent aphrodisiacs – pomegranate, vanilla, chili and champagne – the sensual sauce promises to raise heartrates and is available free of charge from: shop.thesaucyfishco.com. Recipe courtesy of SupergoldenBakes, using Saucy Fish salmon.